Sales Motivation Video: When We Look for the Positive, We Find the Positive. Are you looking for the positive? I have found that the most positive people did not get that way by accident. People who look for the positive more often than not find it. Look for the positive, and you will have greater success in your sales and in your prospecting. 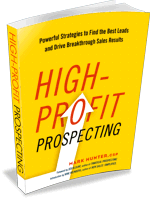 This is just one thing I talk about in my new book, High-Profit Prospecting.